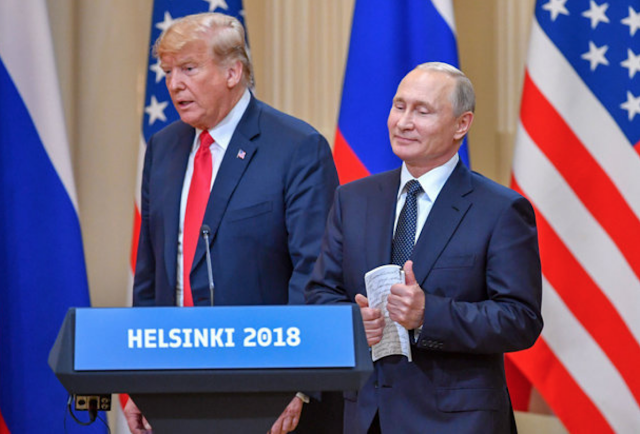 This image (and the cropped close-ups below) show Donald Trump and Vladimir Putin just prior to beginning their joint press conference during last week's Helsinki Summit. It is only an instant in time - but from a nonverbal perspective, it's very telling (see below for other, more comprehensive analyses of this same presser). Look at the overall posture of each man. Putin's spine is upright - perpendicular to the floor with his shoulders relaxed and squared. Holding notes, his hands and arms are flexed with mild activity. His body looks relaxed, ready, and confident. President Trump is in the midst of stepping - so this is not entirely an apples-to-apples comparison - however, his shoulders are hunched with his torso leaning forward - while his neck is also foreshortened. This makes him look weak - like he doesn't really want to be there. His arms should not be resting at his sides in this moment - for it gives him the appearance of an enlisted man, standing at attention (or a subordinate facing reprimand). Trump also forgot to button his suit-jacket (or prefers it). In this setting, such casualness elevates President Putin (making him look athletic, classy, and assertive) and diminishes President Trump. It also accentuates their age difference (the Russian is 65 and the American is 72). Putin's posture projects health, vigor, and dominance - while Trump's configuration conveys a tired, stressed, and submissive emotional tone. 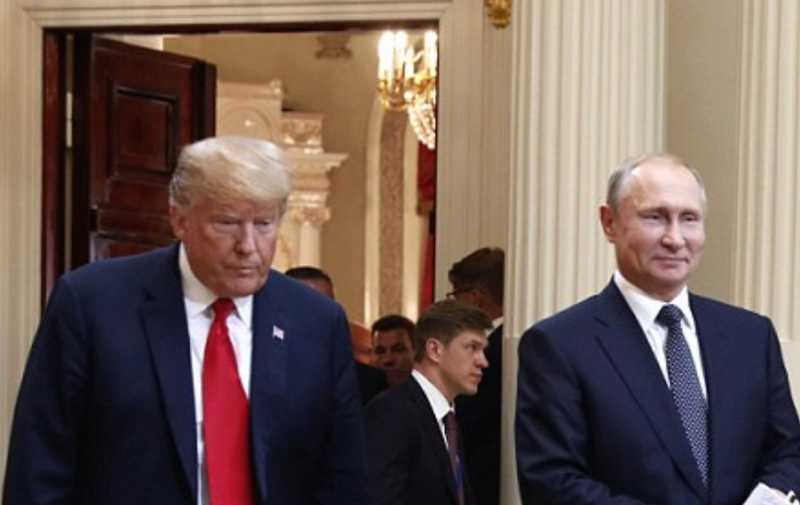 President Trump's head, neck, and eyes are all directed downward during this crucial entrance onto what is, very much, the World Stage. The expression on Trump's face is projecting anxiety and low confidence. Trump is preoccupied. He's not fully present - he's not 'in the moment'. President Putin's expression projects a smug confidence. He knows he's 'already won' before the first word is spoken. 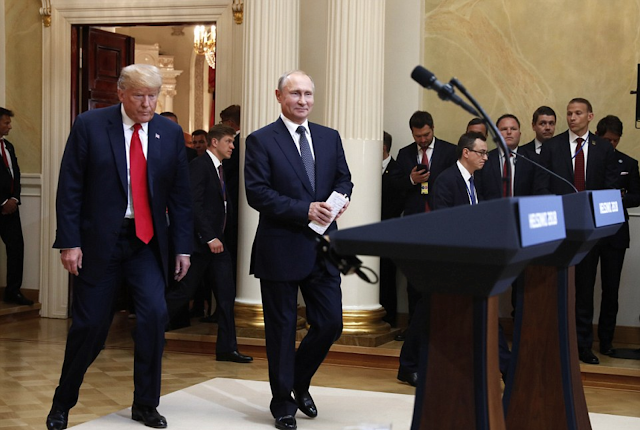 SUMMARY: Trump's nonverbal behavior in this pre-presser moment is worried, tired, and subservient - while Putin is confident, relaxed, and dominant. Vladimir Putin looks like he wrote the script - while Donald Trump looks worried, shell-shocked, acquiescing - as if he's trying to remember his lines.